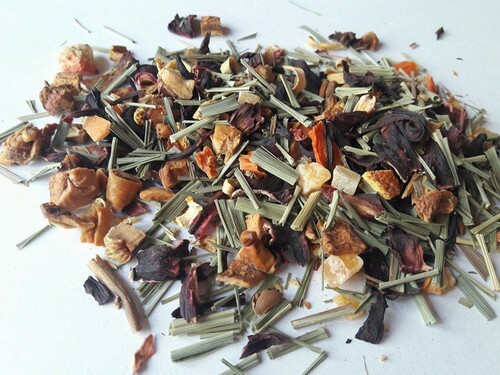 Ingredients: Dried apples 55%, orange peels 4% , papaya 10%, hibiscus 9%, lemon grass 10%, orange flowers 6%; carrot pieces 4%, strawberry pieces 1%, sunflowers petals 1%. Unflavoured tea! Taste: tangy lemony with slightly sweet hint of berries and apples. Features&recomendation with food: Accompanied well with desserts, fruits and sweets. Sugar, honey or fresh mint leaves can be added. Product highligths: Hibiscus as main component in this very festal blend, brings out sour taste and nice cup appereance! We’ve tried to create multitaste fruit tea, which help to relieve thirst in sunny day and serve warmness whenever it’s necessar. Can be served as cold drink on rocks of ice.